This tradition has been going on for decades and, many years ago when it started, it was, in many ways, ground-breaking ecumenism. It is a lot of hard work for Susan and her friends who do all the hard work supported by the scouts of 2nd Cork, St Fin Barre’s, Scout Group who oversee the parking and do the washing up. Being a holiday time, not everyone is able to accept our invitation, but there is always a very strong and full representation of life in our nation ,as well as in our City and County. The attendance is led by Cork’s first citizen, the Lord Mayor of Cork, Cllr Tony Fitzgerald and the Lady Mayoress, Georgina Fitzgerald, accompanied by the CEO of the City Council, Ann Doherty. They were joined by Councillors, former Lords Mayor of Cork, and representatives of City Council management and staff. Often Government ministers from Cork are present but, this year, many were travelling, as was the leader of the opposition, Micheál Martin, T.D. Deputy Margaret Murphy-O’Mahony (Cork South West) was present, as were Senator Jerry Buttimer (Leader of Seanad Éireann) and Senator Colm Burke. 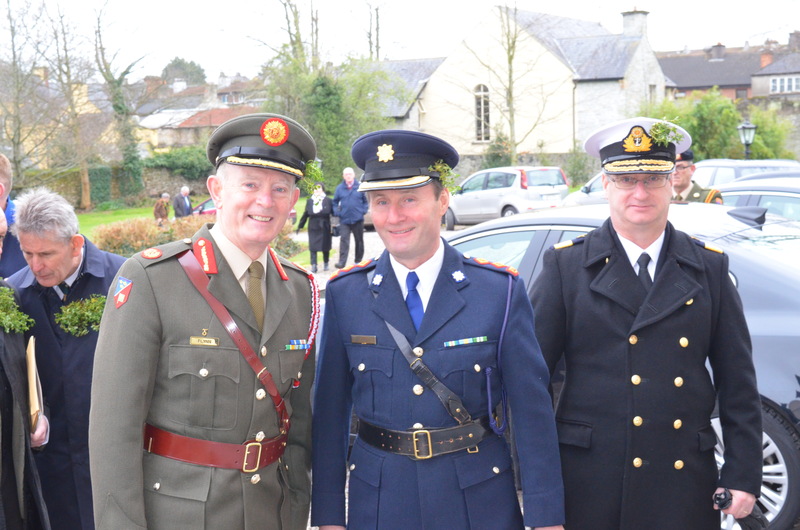 At the Saint Patrick’s Day Civic Service were (l-r) Brigadier General Patrick Flynn, Chief Superintendent Barry McPolin, Commodore Mick Malone. The Defence Forces were represented by Brigadier General Patrick Flynn, the Naval Service by Commodore Mick Malone, and An Garda Síochána by Chief Superintendent Barry McPolin. From the world of education the following were present: the President of the Cork Institute of Technology, Dr Barry O’Connor, Mr Ted Owens, CEO of the Cork Education and Training Board, Mr Roger Flack, Chairperson of the Board of Saint Luke’s National School, Douglas. Among the consular corps present were Sir Freddie Pedersen (Honorary Consul of Denmark) and Ms Cathy Goode (Vice-Consul of Spain). Mr Michael Mulcahy, Consul Emeritus of Poland was present, representing Cork Civic Trust. Mr Philip Gillivan, President, represented the Cork Business Association, and representatives of other Cork businesses were also present: Helen Arnopp of AIB, Claire Nash of Nash19, Manus O’Callaghan of Southern Advertising, Finbarr O’Shea of The Flying Enterprise, Robin O’Sullivan and Ann-Marie O’Sullivan of AM O’Sullivan PR. Among healthcare partners in the Diocese represented were The Mercy Hospital (Ms Sandra Daly). 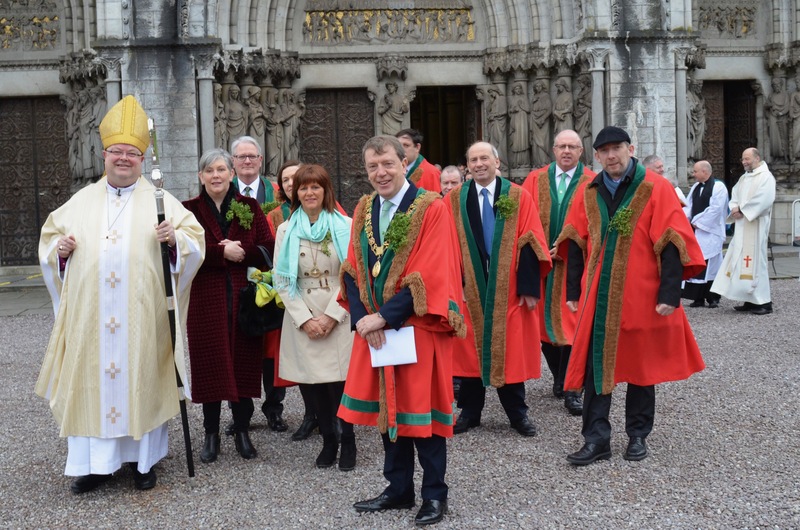 Members of the Chapter of St Fin Barre’s Cathedral in attendance were joined by representatives of other churches included the Very Reverend Christopher Fitzgerald (Ecumenical Officer, Diocese of Cork and Ross), Father Gerard Dunne, O.P. (Chaplain of University College Cork). Also present was Denise Gabuzda from the Society of Friends. Among the youth organisations represented were: Irish Girl Guides and the Scout Association. In addition to a group of young people from S.H.A.R.E., community groups and charities represented were: the Cork Federation of Women’s Organisations (Clare Poole), the Irish Heart Foundation (Paddy O’Brien), the Lapp’s Charity, the Mercy Hospital Foundation (Julie Harris), Saint Aloysius’ Past Pupils Union (Carmel Desmond), Saint Stephens’ Protestant Orphan Society, and the St John’s Ambulance Brigade. The new Director of the Cork Gay Project, Pádraig Rice also attended, as did Ms Mary Crilly from the Cork Sexual Violence Centre. 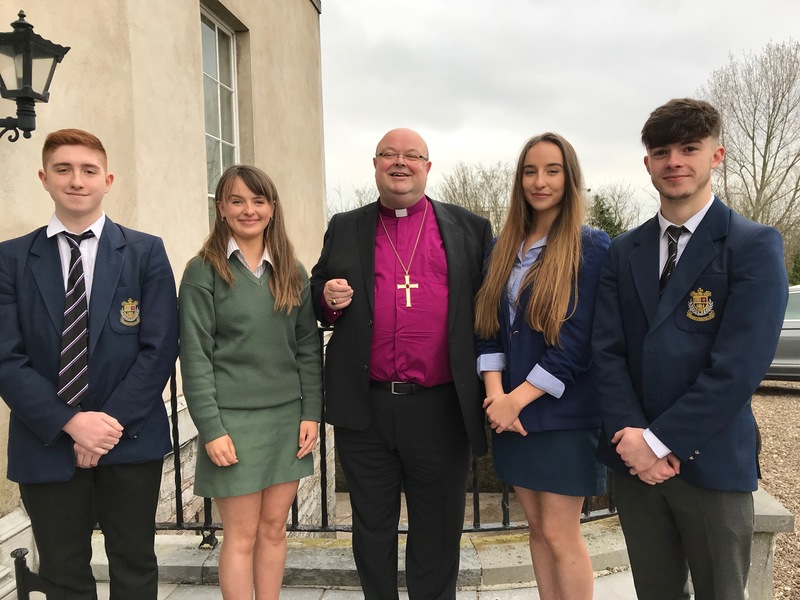 Representing the the Diocese were: the Diocesan Secretary (Mr Billy Skuse), the Assistant Secretary (Ms Susan Perrott), the Diocesan Solicitor (Ms Carol Jermyn), the Diocesan Architect (Mr Bill Brady), and the Warden of Lapp’s Court (Mr Paul Smyth). Every year some lay volunteers within the parishes of the Diocese are also invited. Bishop Colton’s sermon on the occasion may be read HERE. 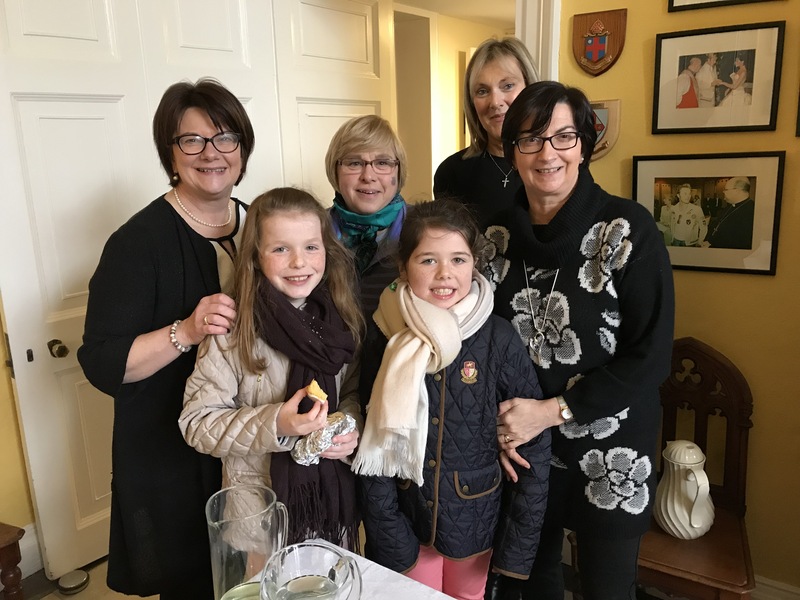 This entry was posted in Bishop, Church in Society, Church Services, Community Involvement, Cork, Diocese, Lord Mayor of Cork, People from Cork, People from the Diocese, Saint Patrick's Day, Saints Days. Bookmark the permalink.